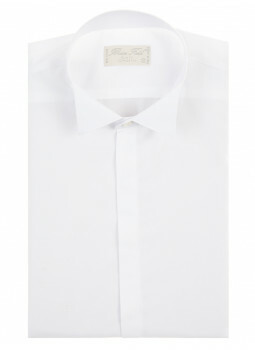 Shirt man slim fit white wing collar Pinnacle of elegance and evening chic, this shirt wing collar is worn with a tuxedo and bow tie. The white poplin adds a touch of refinement. For a sleek design, the buttonhole is hidden. The last buttonhole is horizontal. The collar tux and his spikes are semi-rigid. Bruce Field is the daily partner of your style, and it is also for each event in your life. Check out the collection of Bruce Field of wedding clothes and ceremony. Be stylish at every occasion, thanks to the clothing of ceremony Bruce Field made with care in materials of high quality. Costumes, tuxedos, ties, knots, butterfly, cufflinks and accessories, you will find everything you need to create and hone your outfits ceremony among the creations of Bruce Field.